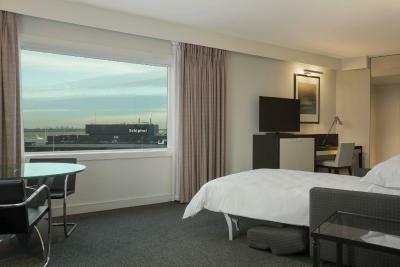 Lock in a great price for Sheraton Amsterdam Airport Schiphol – rated 8.6 by recent guests! My stay was great. the atmosphere was nice. The location was convenient. The service was great in the beginning, but wasn’t satisfied in the end. The location is right outside the airport so that was amazing! We woke up and went through security (got a little lost because this airport is huge) and then went to our gate! They had a front desk to help us navigate the city which was cool - they gave us tips on where to go. The hotel is just a few steps from the airport, very close! Great services and staffs. A great place to stay! Hotel very close to airport and train station - within walking distance - but I wish the website had more details about navigation so it was clear how to get there ahead to time for anxious travelers. I had emailed the property for more travel details but my inquiry was never returned. Rooms were very nice and clean. Great brunch. We also loved the bath robes and shower! Each time I have an overnight stay in Amsterdam in order to catch a connecting flight or train, I always stay at the Sheraton Schiphol. Conveniently located adjoining Schiphol property, you do not need to leave the airport...you just take a escalator to the hotel. The staff are friendly, professional, and accommodating. 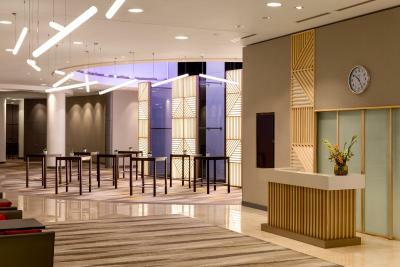 The property is well maintained and caters to business travelers. The price is a bit high, but totally worth it, as other “hotels near Schiphol” are a bus ride away, to an industrial area where there are no services, bars, or restaurants. Staying at Schiphol airport is like staying in a village. The airport has wonderful shops, bars and restaurants in the general public area (pre-security). Highly recommend. Loved that special amenities were provided to my dogs and make us feel truly welcome, not just tolerated. Sheraton Amsterdam Airport Schiphol This rating is a reflection of how the property compares to the industry standard when it comes to price, facilities and services available. It's based on a self-evaluation by the property. Use this rating to help choose your stay! The 4-star Sheraton Amsterdam Airport Schiphol has direct access to Schiphol International Airport and is only 20 minutes by train from Amsterdam city center. It includes a gourmet restaurant and modern fitness facilities including a sauna and a steam bath. The 407 sound-proofed rooms include satellite TV, modern décor and a refrigerator. Each room benefits from a Sheraton Sleep Experience, including a duvet and hypo-allergenic pillows. Lunch and dinner in the Stripes Restaurant are prepared using a charcoal grill. The hotel also includes a hotel bar and the Runway Café. 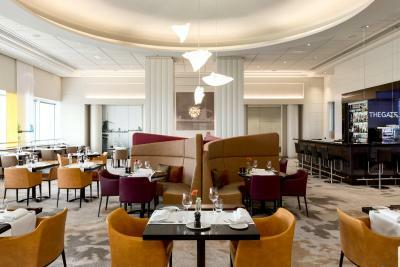 The Club Lounge features complimentary food & beverage options, personalized services and high-speed internet. Lisse, featuring the Keukenhof gardens, is a 20-minute car journey from the hotel. The beach in Zandvoort is 30 minutes away by car. This property also has one of the top-rated locations in Schiphol! Guests are happier about it compared to other properties in the area. 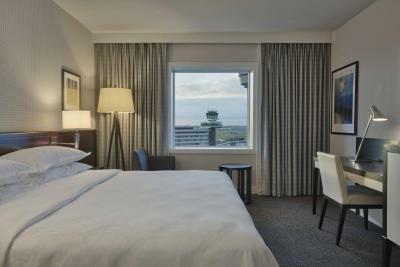 When would you like to stay at Sheraton Amsterdam Airport Schiphol? This double room features a bathrobe and soundproofing. Private parking is available on site (reservation is not needed) and costs EUR 48 per day. This double room has soundproofing and bathrobe. This double room features a seating area and soundproofing. This double room has a seating area and soundproofing. This double room features a soundproofing and a seating area. This double room offers soundproofing and access to the Club lounge. 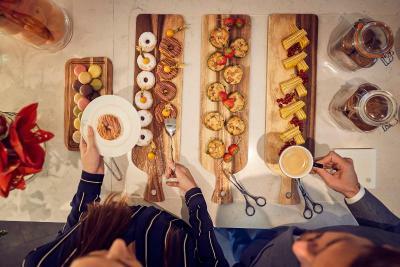 House Rules Sheraton Amsterdam Airport Schiphol takes special requests – add in the next step! Sheraton Amsterdam Airport Schiphol accepts these cards and reserves the right to temporarily hold an amount prior to arrival. Please note that the security deposit of EUR 50 is charged per person per night and needs to be paid upon arrival. Please note that parking packages are available upon request. Please contact the property in advance. Superb location. Our overnight stay was for a day in Keukenhof. It was a seamless 5 minutes from Schipol Arrivals, an excellent meal, very comfortable bed, great breakfast and a 5 minute walk to the Keukenhof bus. What I didn’t like is the fact that when I went to check out they told me I have a balance on my room. How is that possible when I was suppose to have paid in full when I check in they even took 50 euros deposit. I was there for two days if they saw that the person made a mistake by the check in why not call the room the same day or even the next day why wait till i checking out. I really did not appreciate this at all if time was not against me I would have made it a issue. I don't like inside rooms. The shower was tiny and there was only one soap for 2 people. No drinks in the bar-fridge and we had to pay €14 to order up a bottle of water. The bed was comfortable, the staff were efficient and friendly. 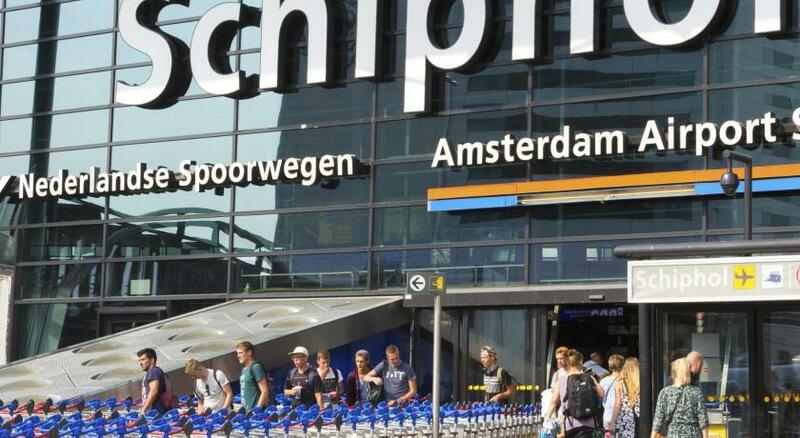 The location is very convenient for Schiphol airport. No fault of their own, but the view is literally the airport so that was a bit lame. Room to cold (tried to set the temperature but still not working), no sleepers bcs floor very cold in bathroom. No electric kettle so we can’t drink warm water as we really need to drink warm water. Very good location for Keukenhof trip - the bus stop is 50 metres from the hotel. Breakfast is absolutely amazing! Excellent location to airport. 1mins walk along covered walkway with travellators making it easy even with heavy luggages.